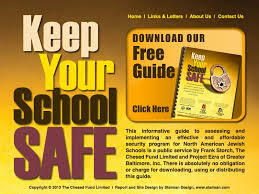 A little more than a year ago Frank Storch, a safety expert from Baltimore, published a safety guide that has made an impact on schools all around the country. Storch’s 44-page booklet, called “Keep Your School Safe” gives advice and easy to follow instructions on how to upgrade the level of security in schools and other public facilities. Is Your Jewish School Really Safe?